So you've got this awesome new course or program you want to launch — yay! You came up with a name, created a logo, bought the domain and told all of your friends about it. But then what? Rather watch this on video than read? Scroll down to get the video! It's hard to know what to work on first when you're not even sure what you should work on at all! Do you start with creating the course materials, or write a marketing plan? What about setting up a website and social media handles? The first thing is to write down every detail of what this project will involve. How much time and money will it cost you to create? You want to make sure it's even feasible considering your budget and schedule! We typically do the "fun" things first — design the Instagram graphics and outline the course — but procrastinate on the no-so-fun tasks like creating a sales plan, writing email sequences, researching payment platforms and creating a strategic marketing plan. Team — Anyone who can help with the above! 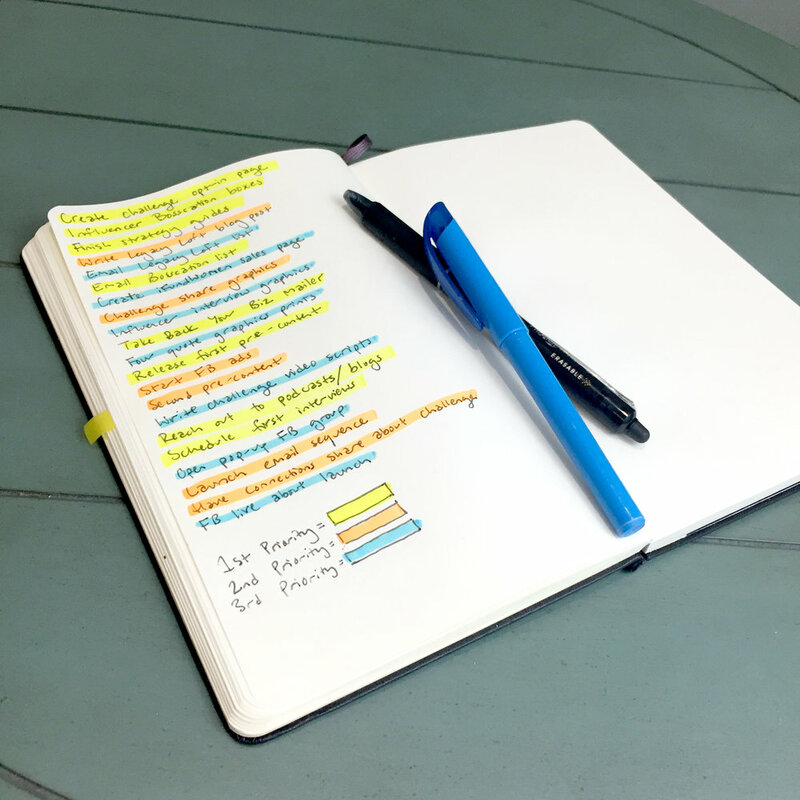 From here, go through your list and highlight or mark all of the tasks that must happen before you launch and the things that are the most urgent. If you only got around to a few things, what would need to happen? Then do a second round with the next priority — what else is pretty important to complete or next up time-wise? Do this again for a total of 3-5 levels of priority (less if you're launching sooner, more if you have a little more time). Your lowest level should be things that are a bonus if they actually get done, so don't leave any essentials in that tier. 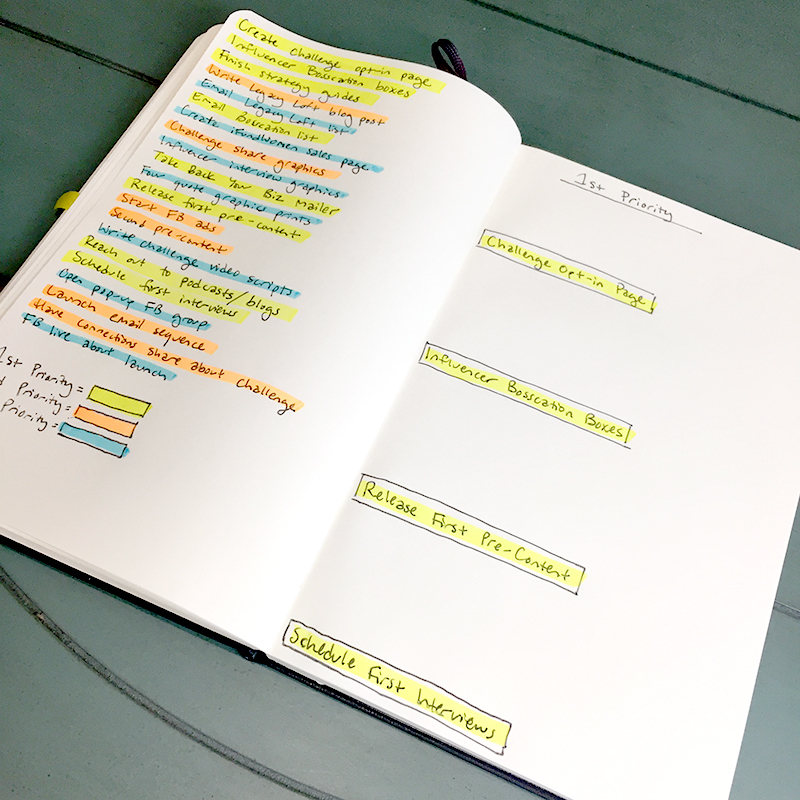 From there, take your top-priority and most urgent tasks and write them on a sheet of paper, leaving space above each one. Then ask yourself what milestones do you need to achieve first in order to complete this task? If you need to set up your sales page, what do you need to go on that sales page? Copy, graphics, photos, pricing, refund policy, etc. Now work backwards again — what goes into each of those? Hire a copywriter and a photographer, calculate overhead costs to determine pricing, pick out fonts and colors before designing graphics, etc. You should be working your way from the main task up. Repeat this phase for each priority level of tasks from exercise two. Now that you have each priority broken down (or should I say up? ), they're already pretty much in order of what needs to be done first. From here, you just need to schedule tasks out for each week leading up to your launch date. You do have a launch date, right? If not, you can use this time to determine when you'll be ready to launch. Add a 1, 2 or 3 next to each item on your first priority list. All of the 1's are now your first week's to-do list. The 2's are your second week, etc. Keep working through your other priority sheets until you have a full schedule of tasks from your current date through launch. Breaking it down like this allows you to work on little pieces of each bigger task, so you don't spend all of your time building your course content and completely neglect your marketing plan. Suddenly your overwhelming to-do list is a little more manageable. You'll be sure to prioritize the right tasks, so you don't get caught up spending all of your time on Instagram rather than building out a solid marketing plan. 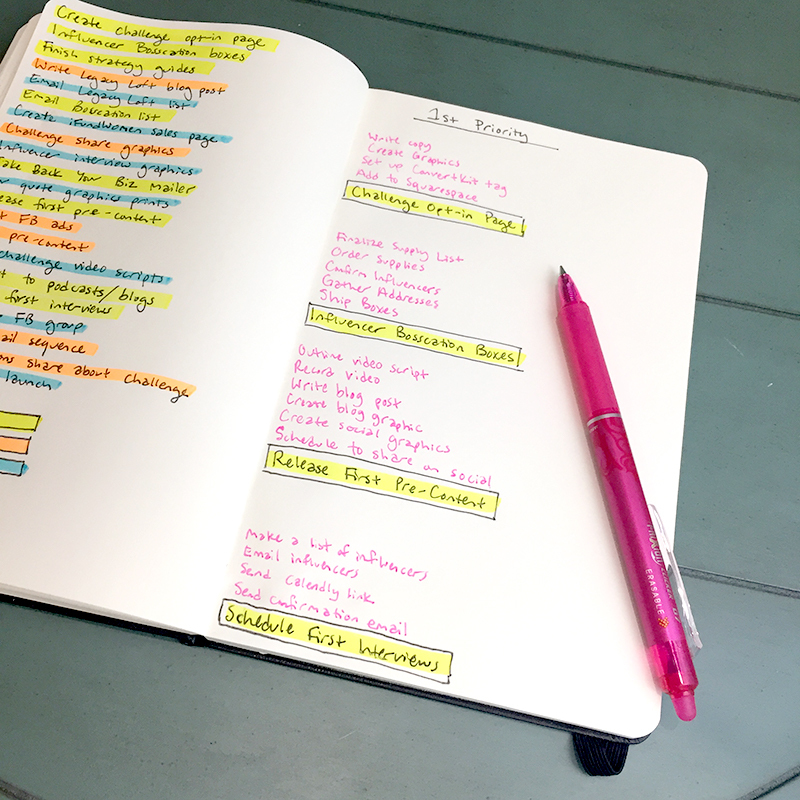 I'm sure there are a lot of other ways to break down your to-do list and prioritize tasks. Let me know what YOU do in the comments.